Children stand in a large circle and explore the following movements with a parachute. Ripples: Shake the parachute vigorously. Children can make ripples while jumping. Waves: Slowly lift the parachute up and down. Use a full range of motion: “Down” is squatting down, and “up” is arms fully extended. Umbrella or mushroom: Children start in squat position. On a group count of three, children stand and extend their arms lifting the parachute overhead. 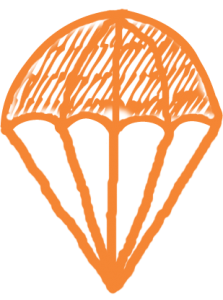 Children bring the parachute down to their toes and watch the air slowly come out of the parachute. Colour call: The class lifts the parachute to make a “mushroom.” When the parachute is at full height, call out a colour. All children holding that colour let go of the parachute and run underneath where they shake hands with someone else under the parachute, and quickly return to their spot before the parachute floats down. Start with sitting down and progress to standing.